Healthinfo Island is directly west of Virtual Ability island. It houses several facilities related to health and wellness, including displays and exhibits on topics about health and wellness. 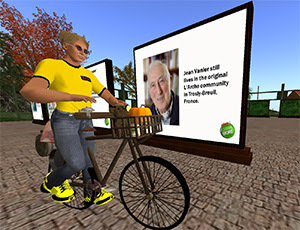 During Virtual Ability conferences, displays and exhibits provide additional information on topics related to the conference theme. The theme of the 2016 International Disability Rights Affirmation Conference is “We’re Part of the Community.” Conference attendees will have an opportunity to learn from series of posters in addition to hearing from the presenters. Virtual Ability member Mook Wheeler has created several educational displays and exhibits. Additional poster sets will be appearing as we move toward the opening of IDRAC 2016 at 8:00am SLT (US Pacific Standard Time) on Friday, November 18. Be watching for them!